Suicide Squad might be funny, but it isn't what you would call lighthearted fare. A roster that includes villains like Deadshot, Enchantress, Killer Croc, and of course The Joker would seem to necessitate a darker tone overall. Tone notwithstanding, the cast still found ways to liven up things in between takes. 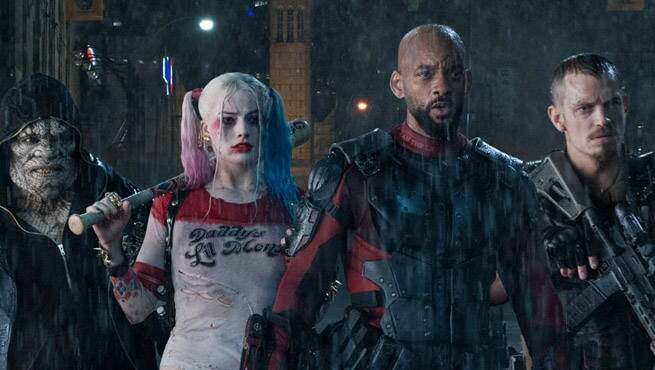 In a recent interview with MTV, Joel Kinnaman (Rick Flag), Margot Robbie (Harley Quinn), Will Smith (Deadshot), and Cara Delevingne (Enchantress) spoke about what they did to lighten the mood, which led Smith to reveal something that he discovered throughout filming. "I've worked with a lot of casts, and I have to say that this is the horniest group I've ever worked with without question. This is the horniest cast I've ever worked with. There is sort of a viral horniness that happened with this cast." After being pushed for details, no one would give up any information as to what led to the title, but Smith couldn't resist saying "I probably need to pull out here right? (Cymbal sound), I'll be here all week folks!" Other noteworthy tidbits included Kinnaman's struggle with finding his marks, which the cast took pleasure in pointing out "With luminous tape on the floor, clearly laid out in a cross" recalled Delevingne recalled. Smith added "Yeah we were trying all kinds of things to get Joel to get anywhere near his marks, just shoving him over. I just started bumping into him, like in the scenes knocking him onto his mark." The cast continues to seem completely in rhythm in their press appearances, and hopefully, this translates to the film as well. Suicide Squad drops on August 5th.